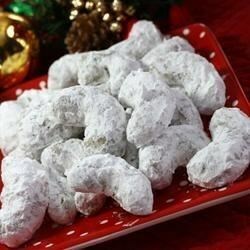 "Pecan wedding cookies rolled in confectioner's sugar." Cream butter or margarine, gradually adding confectioners' sugar and salt. Cream until light and fluffy. Stir in pecans and vanilla. Add flour gradually. Mix well. Shape dough into crescents using a teaspoon full for each crescent. Place on ungreased cookie sheet and bake 15-30 minutes. Do not brown. Let cool slightly, then roll cookies in additional confectioners' sugar. I followed the recipe exactly. I found that they spread some on the cookie sheet, so they are not perfect crescent shape. The taste is good, but not a favorite a my house. I'm too lazy to shape crescents so I use my small cookie scoop, portion them all out, then roll them into smooth balls. Perfect with a a cup of tea. These were soo good and so easy. I made 2 x in 1 week because my husband kept eating them up! I can't wait to impress my cookie exchange with this one! These cookies are delicious! They are a bit sweet, but go fabulous with a strong cup of coffee or tea. These are tasty. Just be sure to use very finely chopped pecans. I didn't chop mine up quite good enough and it made the cookies fall apart when I tried to roll them.